On Tuesday, Southampton’s win over Swansea virtually ensured relegation for Swansea and safety for Southampton. The result also condemned WBA to relegation. On the following day, Huddersfield were saved after (1-1) tie at Chelsea. This hampered Chelsea’s CL chances. Manchester United ensured second place after a scoreless draw with West Ham. On Sunday both Tottenham and Liverpool ensured CL qualification at the expense of Chelsea who lost at Newcastle (0-3). In Liverpool’s (4-0) win over Brighton, Mohamed Salah scored his 32nd Premier League of the season which is a new record. However, Manchester City’s win over Southampton (1-0) set another new record in a season that the club broke so many records. - N’Golo Kante was voted as Chelsea’s player of the year by the fans. Andreas Christensen was voted as the club’s young player of the year. 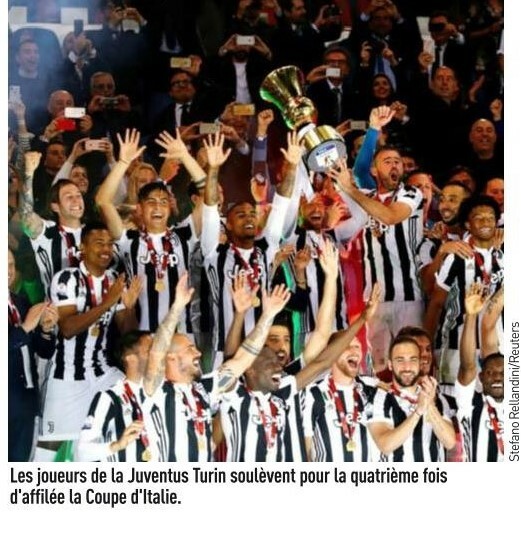 Juventus had a memorable week. 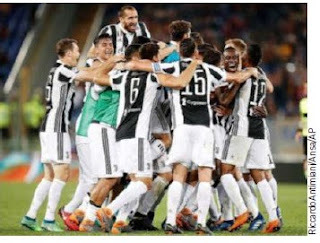 On Wednesday, they defeated AC Milan (4-0) to win the Coppa Italia in a match that AC Milan goalkeeper Donnaruma made a couple of mistakes that lead to goals. On Saturday, Inter’s home loss at Sassuolo damaged their CL prospects with Lazio now having the upper hand for that spot. The impending transfer of Lazio’s Dutch defender Stefan De Vrij to Inter created some controversy as some felt he would not be as motivated now to help his current club, however, the club backed the player. 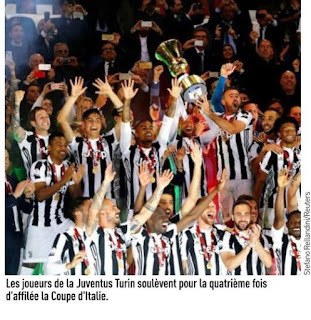 On Sunday, Juevntus got the point they needed in a scoreless tie with AS Roma to clinch their unprecedented seventh straight Scudetto (as well as Fourth straight double, all under Allegri). Napoli Manager Maurizio Sarri appears set to be leaving the club. For the National Team, Roberto Mancini was officially confirmed as the next Manager. On Wednesday, Villareal gave Barcelona the guard of honor that Real Madrid had refused. 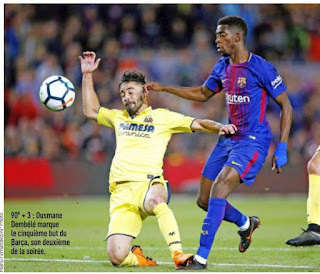 On Sunday, Barcelona’s quest to end the season undefeated ended as Levante defeated them (5-4) after going ahead (5-1). There was some controversy as to why Valverde chosen to rest Messi. Some speculated that there was an agreement with the Argentina Federation to rest him for the World Cup now that the title was ensured. There was continuous chatter about Neymar signing for Real Madrid in the near future. However, the likelihood appears to be about the transfer of Griezmann from Atletico Madrid to Barcelona. -During Manchester City’s title celebrations, Oleksandr Zinchenko had accidentally knocked down the Premier League trophy. As a joke, Ilkay Gundogan had twitted about repairing trophies. History was made on Saturday, as SV Hamburg were relegated from the Bundesliga for the first time since its inception (1963/64). The club’s fans protested by throwing flares on the field before order was restored. Jupp Heynckes ended his fourth and last stint as Bayern Munich manager at home vs. Stuttgart (1-4 loss). It was confirmed that Bayern’s Polish striker Robert Lewandowski would remain with the club. Peter Stoeger left his post as Dortmund Manager in a decision that many had predicted for some time. Hoffenheim managed to clinch a CL spot by defeating Dortmund (3-1). 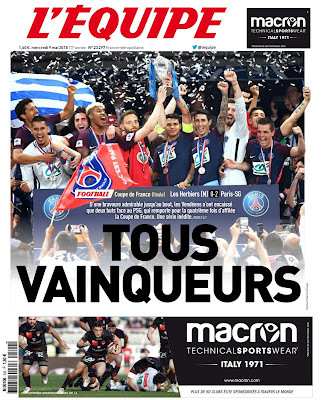 PSG won the domestic treble by defeating Lower League side, Les Herbiers (2-0) in the French Cup Final. Neymar had returned to the Capital for the festivities, however, most of the chatter concerned about his departure . Strasbourg and Lille avoided relegation. Lille particularly has a nightmare of a season that had started under the tumultuous management of the Argentinean Marcelo Bielsa. Monaco jumped back to the second spot with a last minute penalty kick win over St Etienne with one match to go. 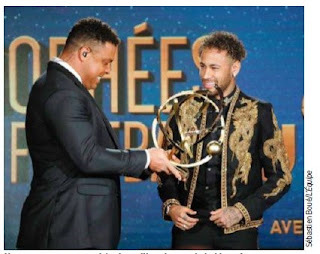 On Sunday, the UNFP awards were handed out and Neymar was elected as the Player of the season. He received his trophy from Ronaldo. Kylian Mbappe was elected as the Young Player of the Year. Thomas Tuchel was officially named as PSG Manager for next season and immediately set about ensuring Neymar’s stay. Young Player : Kylian Mbappé (PSG). 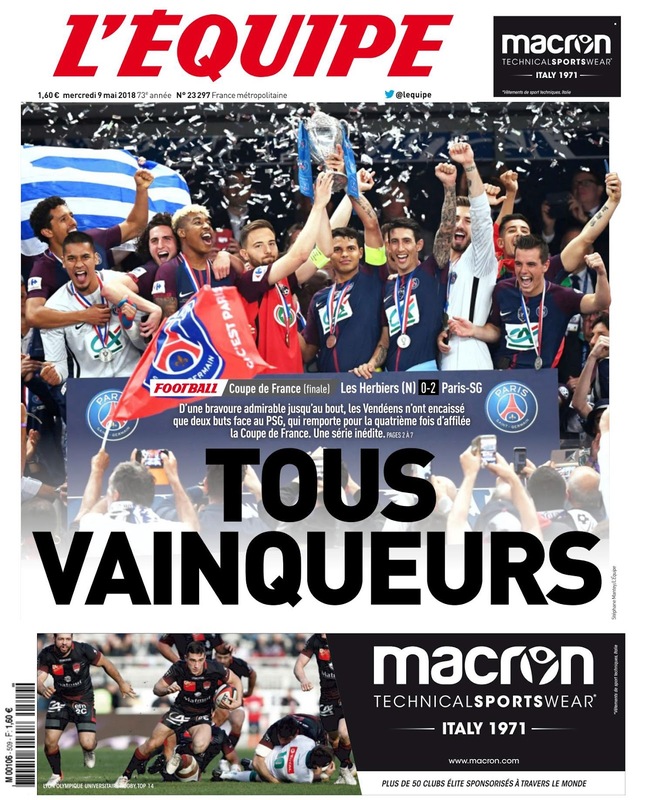 Best XI : Steve Mandanda (Marseille), Ferland Mendy (Lyon), Marquinhos (PSG), Thiago Silva (PSG), Dani Alves (PSG), Nabil Fekir (Lyon), Luiz Gustavo (Marseille), Marco Verratti (PSG), Neymar (PSG), Edinson Cavani (PSG), Kylian Mbappé (PSG). Best XI : Paul Bernardoni (Clermont), Vincent Le Goff (Lorient), Julian Jeanvier (Reims), Yunis Abdelhamid (Reims), Mickaël Alphonse (Sochaux), Teji Savanier (Nîmes), Diego Rigonato (Reims), Romain Philippoteaux (Auxerre), Umut Bozok (Nîmes), Rachid Alioui (Nîmes), Pablo Chavarria (Reims). Goal: Marco Bizot (AZ), Jasper Cillessen (Barcelona), Sergio Padt (FC Groningen) and Jeroen Zoet (PSV). Defense: Patrick van Aanholt (Crystal Palace), Nathan Aké (AFC Bournemouth), Daley Blind (Manchester United), Virgil van Dijk (Liverpool), Hans Hateboer (Atalanta Bergamo), Daryl Janmaat (Watford), Terence Kongolo (Huddersfield Town) , Matthijs de Ligt (Ajax), Stefan de Vrij (Lazio). Midfield: Donny van de Beek (Ajax), Davy Pröpper (Brighton & Hove Albion), Marten de Roon (Atalanta Bergamo), Kevin Strootman (AS Roma), Guus Til (AZ), Tonny Vilhena (Feyenoord), Ruud Vormer (Club Bruges), Georginio Wijnaldum (Liverpool). Attack: Ryan Babel (Besiktas), Steven Berghuis (Feyenoord), Steven Bergwijn (PSV), Memphis Depay (Olympique Lyon), Eljero Elia (Istanbul Basaksehir), Luuk de Jong (PSV), Justin Kluivert (Ajax), Quincy Promes ( Spartak Moscow), Wout Weghorst (AZ). On Sunday, Aberdeen clinched second place behind Celtic by defeating them (1-0) away from home. Rangers were left in third place after an unbelievable (5-5) match with Hibs. After the Hibernian equalizer, their Manager Neil Lennon ran onto the field to celebrate in a gleeful manner and was sent off. Defenders: Barry Douglas (Wolves), Jack Hendry (Celtic), Scott McKenna (Aberdeen), Charlie Mulgrew (Blackburn Rovers), Callum Paterson (Cardiff City), John Souttar (Hearts), Lewis Stevenson (Hibernian). Forwards: Oli McBurnie (Swansea City, on loan at Barnsley), Lewis Morgan (Celtic, on loan at St Mirren), Matt Phillips (West Bromwich Albion), Johnny Russell (Sporting Kansas City). -Benfica have requested the disciplinary commission to review the actions of four Sporting CP players from their match over the weekend. -Sporting Lisbon’s Bruno Fernandes was named player of the month of April. Benfica’s Jonas had been the winner for the past five months. Club Brugge clinched the League title on Sunday. There is continuing controversy over the treatment of Standard Liege manager Sa Pinto, who is likely to be sacked to make way for Michel Preud’homme. Anderlecht manager Hein Vanhaezebrouck was criticized for pointing that out in an interview and was rebuked by most including Sa Pinto himself. 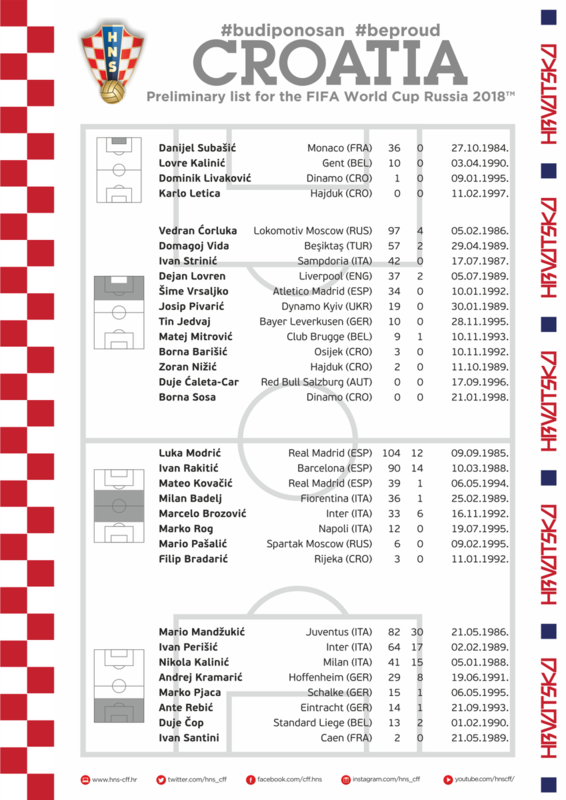 Forwards: Dawid Kownacki (Sampdoria, Italy), Robert Lewandowski (Bayern Munich, Germany), Arkadiusz Milik (Napoli, Italy), Krzysztof Piatek (Cracovia), Lukasz Teodorczyk (Anderlecht, Belgium), Kamil Wilczek (Brondby, Denmark). 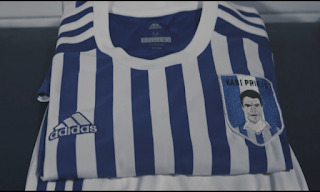 (Additional seven:) goalkeeper Marianato Guilherme (Lokomotiv Moscow); defenders Vladislav Ignatiev (Lokomotiv Moscow) and Dmitry Kombarov (Spartak Moscow); midfielders Denis Glushakov (Spartak Moscow) and Anton Shvets; forwards Anton Zabolotny and Dmitry Poloz (both Zenit St Petersburg). Stikers: Paolo Guerrero (Flamengo/BRA), André Carrillo (Watford/ENG), Raul Ruidiaz (Morelia/MEX), Jefferson Farfan (Lokomotiv Moscou/RUS). 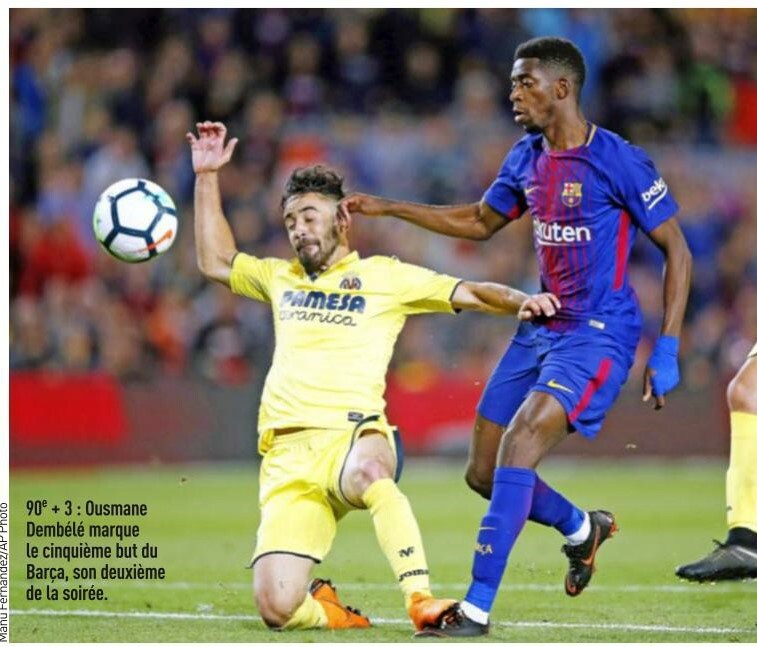 Forwards: Ahmed Musa (CSKA Moscow, Russia), Kelechi Iheanacho (Leicester City, England), Moses Simon (Gent, Belgium), Victor Moses (Chelsea, England); Odion Ighalo (Changchun Yatai, China PR), Alex Iwobi (Arsenal, England), Junior Lokosa (Kano Pillars); Simeon Nwankwo (Crotone, Italy). Alex Gersbach, Jamie Maclaren, Apostolos Giannou, Mitchell Langerak, Bailey Wright and Aleksandar Susnjar have been cut. Goalkeepers: Mathew Ryan (Brighton/ENG), Daniel Vukovic (Genk/BEL), Brad Jones (Feyenoord/HOL). Defenders: Aziz Behich (Bursaspor/TUR), Milos Degenek (Yokohama Marinos/JAP), Matthew Jurman (Suwon Bluewings/CDS), Fran Karacic (NK Lokomotiva/CRO), James Meredith (Millwall/ENG), Josh Risdon (Western Sydney Wanderers/AUS), Trent Sainsbury (Grasshopper Club Zurich/Swi). Midfielders: Joshua Brillante (Sydney FC/AUS), Mile Jedinak (Aston Villa/ENG), Jackson Irvine (Hull City/ENG), Robbie Kruse (VfL Bochum/GER), Massimo Luongo (Queens Park Rangers/ENG), Mark Milligan (Al Ahli/ARS), Aaron Mooy (Huddersfield Town/ENG), Tom Rogic (Celtic/SCO). Forwards: Tim Cahill (Millwall/ENG), Tomi Juric (FC Lucerne/Swi), Mathew Leckie (Hertha BSC/GER), Daniel Arzani (Melbourne City/AUS), Nikita Rukavytsya (Maccabi Haifa/ISR), Andrew Nabbout (Urawa Red Diamonds/JAP), Dimitri Petratos (Newcastle Jets/AUS), James Troisi (Melbourne Victory/AUS). Goalkeepers: Jaime Penedo (Dinamo Bucarest,/ROM), José Calderón (Chorrillo), Alex Rodríguez (San Francisco/USA). Defenders: Azmahar Ariano (Patriots/COL), Felipe Baloy (Municipal/GUA), Harold Cummings (Earthquakes San Jose,/USA), Eric Davis (DAC Dunajska Streda/SLO), Fidel Escobar (New York Red Bulls/USA), Adolfo Machado (Houston Dynamo/USA), Michael Amir Murillo (New York Red Bulls/USA), Luis Ovalle (Olimpia/HON), Francisco Palacios (San Francisco/USA), Richard Peralta (Alliance), Torres Roman (Seattle Sounders/USA). Midfielders: Ricardo Avila (Gand/BEL), Edgar Barcenas (Cafetaleros de Tapachula/MEX), Ricardo Buitrago (Municipal/GUA), Miguel Camargo (San Martin/PER), Adalberto Carrasquilla (Taurus), Armando Cooper (Universidad de Chile/CHI), Anibal Godoy (San Jose Earthquakes/USA), Gabriel Gomez (Atlético Bucaramanga/COL), José González (Unión Comercio/PER), Cristian Martinez (Columbus Crew/USA), Valentin Pimentel (Plaza Amador), Alberto Quintero (Université/PER), José Luis Rodríguez (La Gantoise/BEL). Forwards: Abdiel Arroyo (Liga Deportiva Alajuelense/COS), Rolando Blackburn (Chorrillo), Ismael Diaz (Deportivo La Coruna/SP), José Fajardo (Club Atletico Independiente), Roberto Nurse (Mineros de Zacatecas/MEX), Blas Perez (Municipal/GUA), Luis Tejada (Sport Boys/PER), Gabriel Torres (Huachipato/CHI).